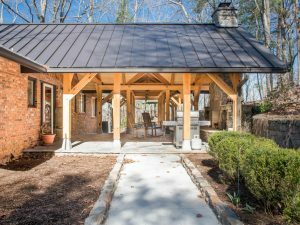 Megan Goostree, Author at Asheville Roofing Contractor | DLV Roofing, Inc. Standing seam metal roofs are continuing to grow in popularity among homeowners, and there are good reasons why! Longevity: Standing seam metal roofs have exceptional longevity of around 50 years or longer. Standing seam metal is resistant to many factors that can support quicker degradation, such as mildew, rot, and insect infestations. This resistance contributes to the longevity of standing seam metal roofing. Dependability: When compared to other roofing material, standing seam metal is the best protection against harsh weather elements such as snow, ice, and hurricane level winds. 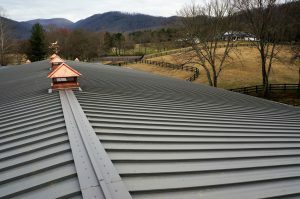 In addition, you will not need to worry about your standing seam metal roof leaking, rotting, cracking, splitting, chipping, warping, or drying out like you would with other common roofing material. Durability: Standing seam metal roofing is impact resistant being the best roofing material to withstand hail, falling tree limbs, etc. In addition, standing seam metal is non-combustible, therefore, it never catches fire. Energy Efficiency: Standing seam metal roofing reflects heat which leads to lower cooling costs in the warmer seasons. Most would describe standing seam metal roofs as practically bulletproof … or so we thought! In 2017, we received a call from a previous DLV Roofing customer informing us that he had a leak in his standing seam metal roof. Our project manager, James Ball, thought this to be odd being that we had just installed a new standing seam metal roof on his home a couple of years prior. Nonetheless, James promptly scheduled a time to meet with the customer at his home to evaluate the situation. During the appointment, the leak was very noticeable from the water ring in the ceiling. James was puzzled as he told the customer, “Standing seam metal roofs are bulletproof!” He was very curious as to what was causing this leak. James, determined to solve this mystery, climbed on the customer’s roof to take a closer look. As he examined the area that he thought the leak was coming from, he found something out of the ordinary causing the customer’s leak; a 45 caliber bullet hole! Immediately, James climbed down off of the roof to inform the customer of what he had found. Needless to say, they were both astonished, puzzled, and amused. After a good laugh, James returned to the customer’s roof and patched the hole. The customer had no explanation for how the 45 caliber bullet hole appeared, however, he and James did conceive a theory. Their suspicion is that a gun was shot in the air, possibly on the recent 4th of July, and descended into the customer’s roof ultimately causing his leak. In conclusion, we would like to clarify, that although standing seam metal roofs can withstand many tests of time… they are NOT bulletproof! We would also like to note that if a gun is shot in the air, the bullet has to land somewhere at some point; so please use extreme caution when using firearms. Do We Roof In Cold Temperatures? 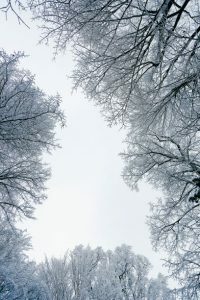 Is cold weather creating hesitation in your decision to have your roof replaced or repaired? Allow us to answer this popular winter roofing worry. DLV Roofing does work in the winter and performs all of your roof system needs in cold temperatures just as we do any other season. However, just as you assumed, the cold weather does affect how we roof. When temperatures dip below 40 degrees, we give our projects special attention. No house is the same and, therefore, we treat each one differently. Each has its own individual needs and we must adapt to the situation at hand. Though it may take our crews a few extra minutes to ensure the job is being done to the best of our ability, quality work is our promise to our customers! Rest assured, if rain or snow make an appearance or we feel temperatures are too low to perform quality work on your roof, our project managers will notify you and work with you to determine Plan B. For further questions or concerns, please do not hesitate to reach out to us! DaVinci Roofscapes Features DLV Roofing! DLV Roofing Systems, Inc., is honored to have been featured in a recent DaVinci Roofscapes article. 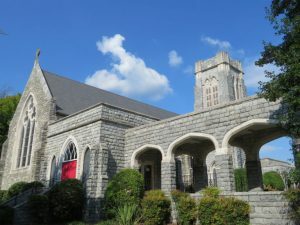 DaVinci proudly highlights DLV’s work of replacing the front roof system on Saint James Episcopal Church in Hendersonville, North Carolina. Upon discovering that the asphalt shingle portion of the church’s roof system would need to be replaced, their hope was to match this section to the area of original, authentic slate that was constructed in 1913. By using DaVinci’s Single-Width Slate in Slate Grey, we were able to do just that! This historical church now presents a defined beauty that resembles the original construction. Read the full DaVinci Roofscapes article here.